Leukemia is cancer of the bloodstream. It is a rare disease that can strike in childhood or later in life. Childhood leukemias are one of the great success stories in the history of cancer treatment, and are among the first malignancies to be cured with chemotherapy. The most common childhood leukemia is ALL, short for acute lymphoblastic leukemia. Work done in the 1960s led to the discovery of chemotherapy combinations that led to cure of a majority of children with this disease. People cured of ALL will go on to live healthy and productive lives. 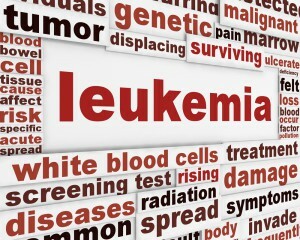 There are acute and chronic forms of leukemia. Acute forms include ALL (acute lymphoblastic leukemia), mentioned above, and AML (acute myelogenous leukemia). Acute leukemias are fast growing cancers treated with aggressive chemotherapy, at least in patients young and strong enough to tolerate this treatment. To determine how successfully the leukemia can be treated, lab testing is done to determine which chromosomes have been altered. Leukemias with certain chromosome abnormalities carry a better prognosis. One form of acute leukemia called APL has a unique chromosomal abnormality, and carries an especially good prognosis. This form of leukemia is treated with standard chemotherapy, and with drugs like ATRA and arsenic. Chronic leukemias have different symptoms than acute leukemia, and look different under the microscope. Chronic leukemias include CLL (chronic lymphocytic leukemia) and CML (chronic myelogenous leukemia). CLL is a chronic disease in which the cancer cells grow very slowly. It can be so slow to progress that some patients never require treatment. If treatment is required, different drugs including chemotherapy, steroids, and targeted therapies can be used. CML is a chronic leukemia that is distinguished by a specific chromosomal abnormality called the Philadelphia chromosome. A new drug called Gleevec is a targeted therapy that is now the standard treatment for CML. It is a biotechnology product that targets the abnormal protein carried by all patients with CML, and has induced long-term remissions in many patients. Hairy cell leukemia is a rare leukemia in which the cells have hairy strands on their surface. This disease is cured in a majority of patients with one 7-day infusion of a drug called cladribine. Bone marrow transplant is an aggressive procedure sometimes used in leukemia patients. It is reserved for younger, healthier patients in whom other treatments have not been successful. Leukemias are a group of diseases in which some can be treated, some can be cured, and some are the type that patients can live with.